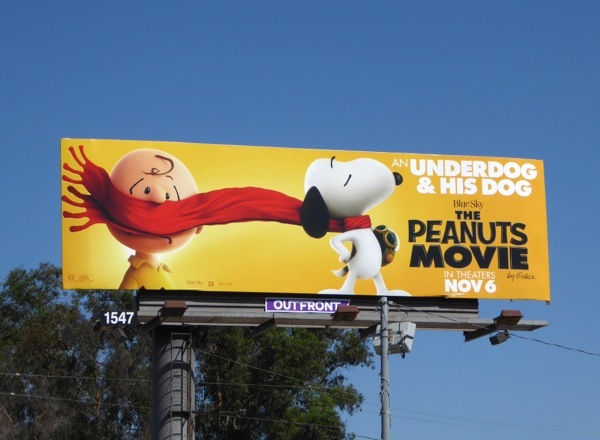 There's nothing better than seeing the friendship between one boy and his dog, that is unless it's one underdog and his dog, like 'ol 'Charlie Brown' and his best pal 'Snoopy'. 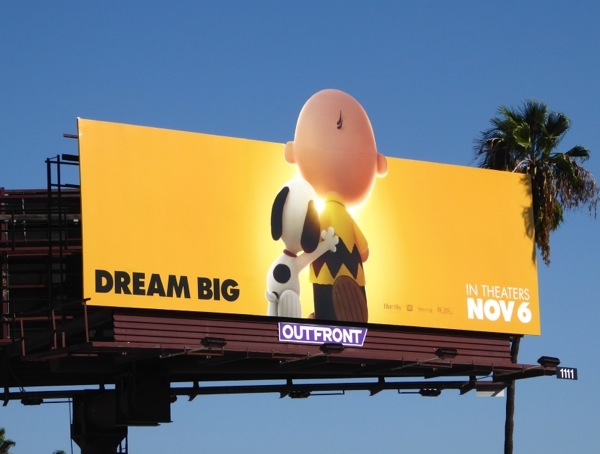 Charles M. Schulz comic strip creations get the big screen treatment in this new 3D computer-animated feature film by Blue Sky Studios. 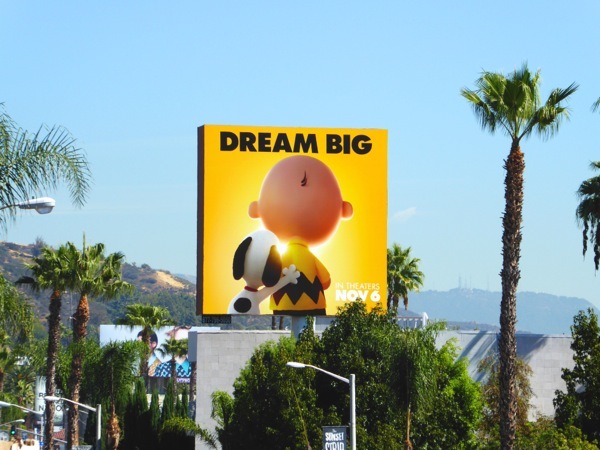 It's time for a new generation to enjoy the delights of Charlie Brown and his school friends, 'Peppermint Patty', 'Lucy' 'Sally', 'Linus', 'Schroeder' and Snoopy's bird pal 'Woodstock'. 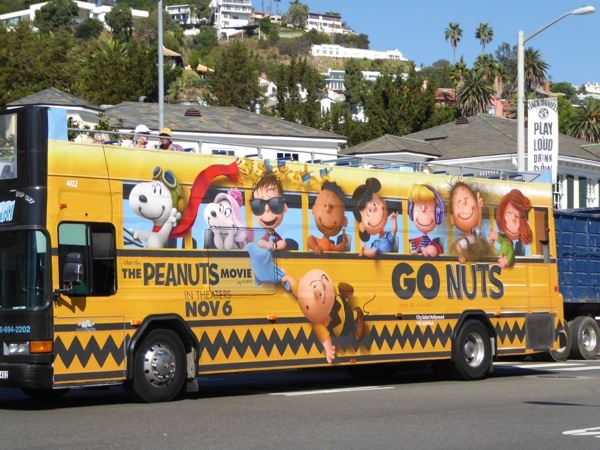 Commemorating the 65th anniversary of the comic strip, in this new animated comedy lovable loser Charlie Brown falls for a new love when the 'Little Red-Haired Girl' moves into his neighbourhood. 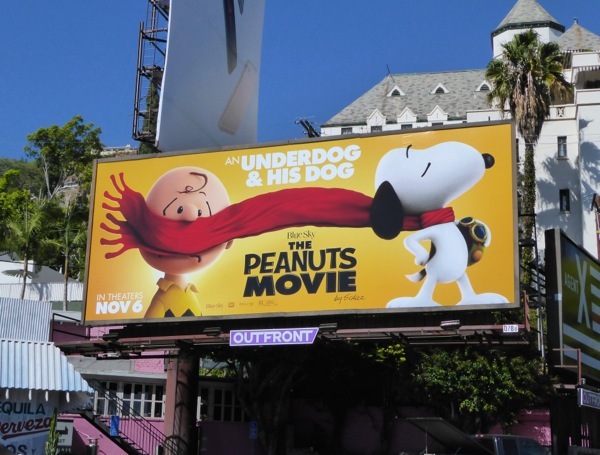 Meanwhile Snoopy takes to the skies in his fantasy world as a World War I flying ace, taking on his nemesis the 'Red Baron', to win the heart and paw of a beautiful pilot named 'Fifi'. 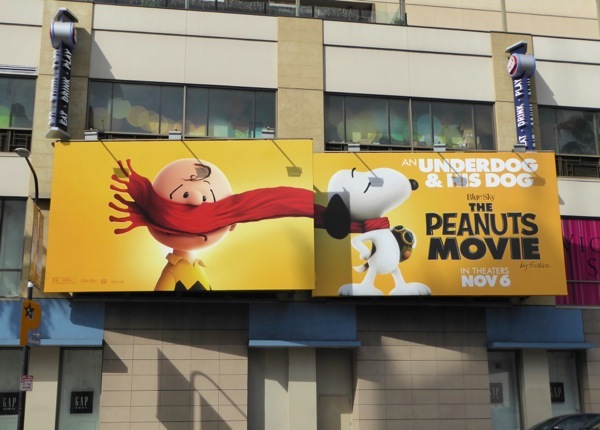 These eye-catching billboards for The Peanuts Movie were snapped around the streets of L.A. (including Sunset Boulevard, Highland Avenue and Venice Boulevard), plus near Union Square in San Francisco, from October 2 to October 14, 2015. 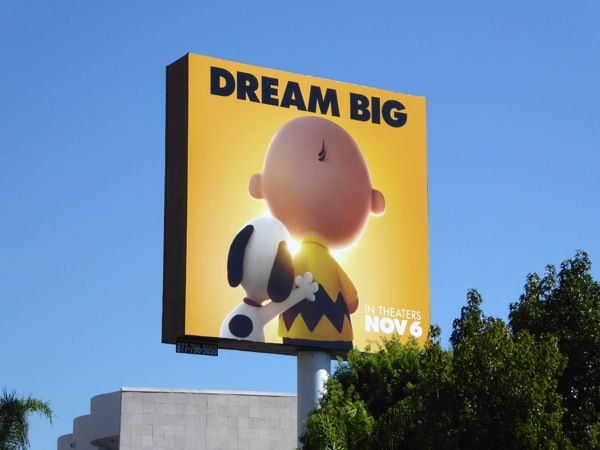 There's something especially sweet and touching about the creative where Snoopy has his arm around his human pal, in his iconic zig-zag t-shirt, heading off into the light. 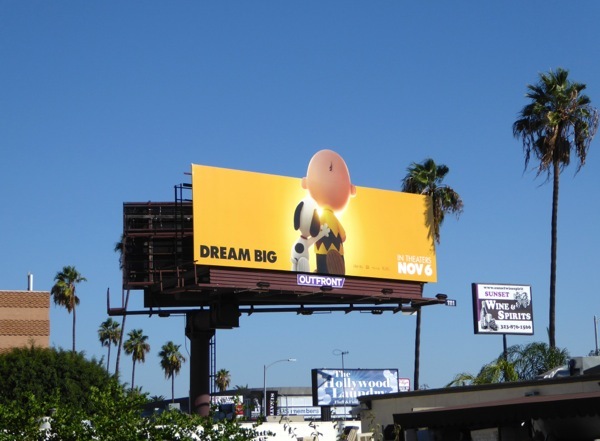 For more animated capers from Blue Sky Studios, be sure to also check out these billboards for Rio, Epic and Ice Age. 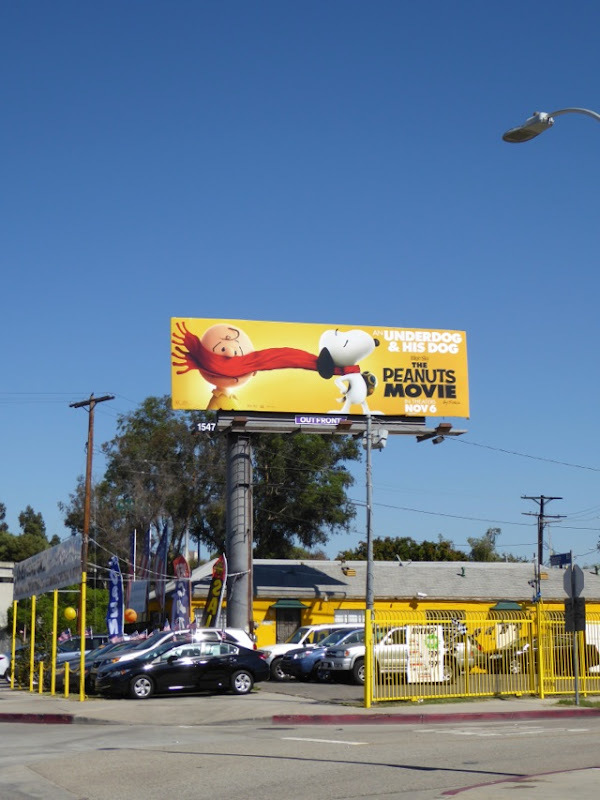 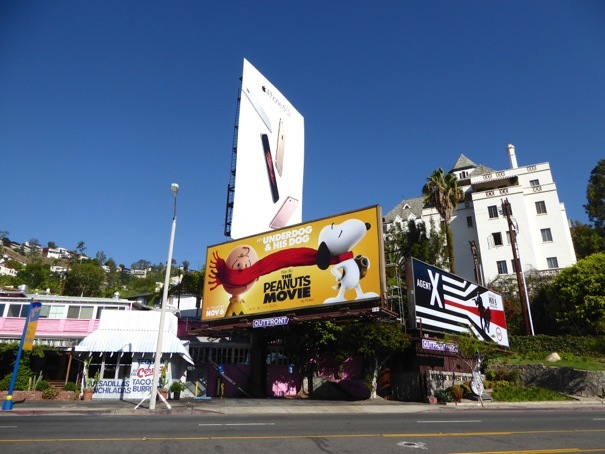 Plus if you're a dog lover, be sure to also check out these fun billboards for the Marmaduke movie, these film billboards for Cats & Dogs and this Mr. Peabody & Sherman outdoor ad campaign. 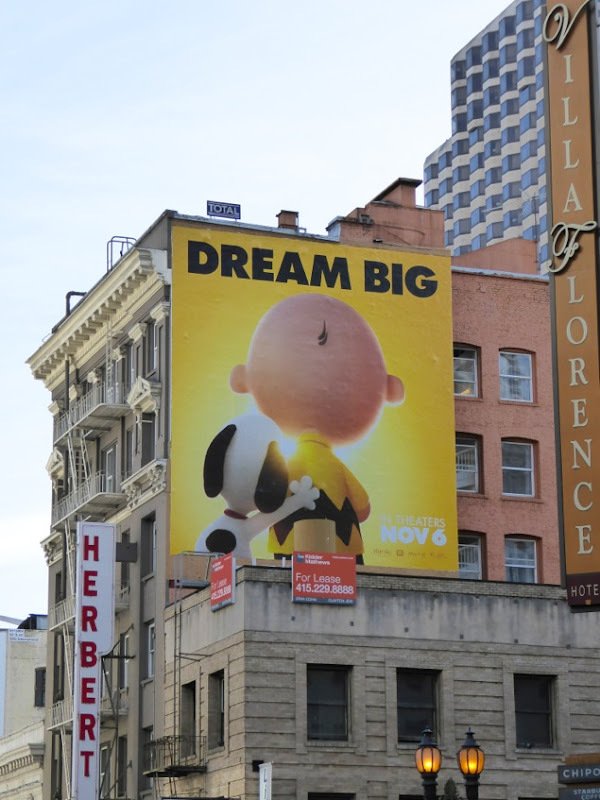 Just remember no matter how many times you've been knocked down in life, you're never too old to dream big.